When it comes to complexity of scuba diving, Scuba Tanks are the poster child of that complexity. You have aluminum and steel. Then you have a plethora of sizes from 6 cubic foot (cu ft) all the way to 120 cubic foot (cu ft). It can be very difficult even for a seasoned pro to make a decision as to which type of tank they will need. Let’s start with the type of materials that are used in scuba diving tanks, steel verses aluminum. Steel scuba diving tanks like all tanks come in a variety of shapes and sizes. The low pressure steel scuba tanks are usually slightly larger in diameter and heavier than the high pressure steel tanks. Steel tanks offer the best all around capabilities for a high capacity at low working pressures. High pressure steel tanks are about the same size as most aluminum tanks, but hold more air at a higher pressure. Both of these scuba diving tanks have excellent buoyancy properties - They don't float at the end of the dive like aluminum scuba tanks will. If properly cared for, a steel scuba cylinder will provide service for decades. The drawback to steel scuba diving tanks, are the likelihood of rust in the internal surfaces of the tank. See our scuba equipment maintenance section on how to prevent this from happening. Aluminum tanks are cheaper and come in more sizes to choose from. Aluminum scuba diving tanks are the most common diving tanks in the world. 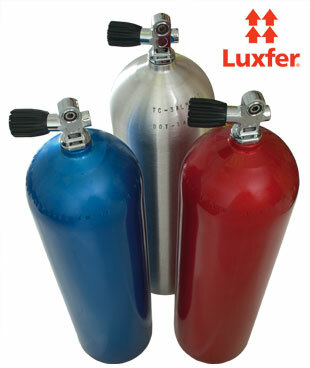 Just about every scuba diving operation in the world uses aluminum tanks. These tanks weigh less than a corresponding steel tank, easier to wear and dive with. Because their operating pressure (3000 psi) is so standardized around the world they can be filled everywhere. These tanks tend to become more buoyant towards the end of the dive. Because they can float when empty, many divers prefer to add extra weight when using them. Lately there has been a new type of aluminum tank called the Compact Neutral tank. These tanks solve for the buoyancy problem by adding more weight by thickening the side walls of the tank. They work at higher pressures usually above 3000 psi. Now that we have covered the basic material differences between scuba tanks, let’s discuss their usage. The Safety bottles or bail out bottles tend to be smaller in size. Usually these tanks are 40 cubic foot or smaller. The smaller 6 or 13 cubic foot tanks make for great backup bottles. The key to choosing the correct size is how far or how much time in minutes will you need in an out of air emergency to make it directly to the surface. I have seen many experienced deep divers use a 40 cubic foot tank at their safety or decompression stop. When choosing your size of scuba tanks the first factor you need to figure out is how long are you going to be down? Then how long is your buddy going to be down? It does you no good to come up with ½ tank when your buddy surfaces from the dive. Since I usually use the less air in my dive groups and my dive buddies tend to be newer divers, I usually select my old steel 72 cubic foot tank for each dive. The specialty scuba diving tanks really are a menagerie of choices. There are double tank setups and Nitrox scuba tanks. I have seen 40 cubic foot tanks acting as a transit tanks. The latest of these specialty tanks are the newer carbon composite hoop wrapped tanks that support working pressures up to 4350 psi or 300 bar. How to buy used tanks page.